It’s real. It’s really real. Like, I’m not fibbing at all. It’s real. I’m a published author. Okay, let’s backup a little. On April 30th, I received an email with the subject line “Quick Question About Your Writing”. I sometimes get emails from people who have found my email address on AO3 and want to ask something lengthy rather than post a comment. I get emails sometimes asking if it’s okay for someone to translate my fanfiction into other languages. (I know, I’m so cool.) Right off the bat, I figured it was probably another of these. I haven’t written fanfiction in a few years now, so they’re much less frequent, but it still happens. I opened the email, and a few minutes later, sprinted at full speed down the hall to my parents’ room. She threw her phone in surprise. It was around 7AM, and she was watching General Hospital, her favorite show. She fumbled to grab the remote to pause it before promptly screaming back, “WHAT? !” Double punctuation and everything. My next step was to make sure this was a real thing. Who was Z Publishing House? I checked out their website, and was pleasantly surprised that this was a thing they did. They gathered authors from different states and published them in emerging author anthologies. Okay, that’s super cool. I replied, gushing about how grateful I was, and of course I’d love to add to the anthology! I was directed to the guidelines for submission and promptly had a minor panic attack. Good grief, this was an anthology of short stories. Let’s backup even further. Short stories and I do not get along. In college, I decided to take all four offered workshops–fiction, nonfiction, poetry, and screenwriting. After that, I also decided to take all four advanced workshops. When I was applying to colleges, I tried to put my mother in an early grave by applying to one college that only accepted sixteen students into their program. (I’m sorry, mom.) I had to put together a portfolio that showcased my work (I cringe now just thinking about it), and I had probably one short story in total to put in there. I had some poetry, and I put a bunch of excerpts from my novel (oh god, I’m sorry), and that one whole short story. Yup. So, I get to college, and you know, it’s funny, semester-long workshops don’t give you time to write novels. Ha ha, said bright and shining new college Mary. I can totally do this. College was great. It really helped me learn where my strengths (novels) and weaknesses (screenwriting is the devil) were, and how to evenly work on both of those things. It helped me discover something I didn’t know I loved enough to write whole books worth of it (poetry) and reminded me that some things are truly the most difficult thing on the planet (nonfiction). I am the writer I am today because of the University of Maine at Farmington’s Creative Writing program. When I graduated college, I really missed writing, but I didn’t really do anything about that. I just kept writing fanfiction and recycling the same novel over and over again. I’ve told this story a few times on here, so I won’t go into the Ronan part, but what finally got me out of my rut was something called Writers of the Mark. Oh yeah, that’s totally still a public thing that you can access. My friend (at the time), Jack, and I decided to create a space where we could post short stories or poetry and critique them for each other. The title is a clever play on words referencing the Rohirrim from Lord of the Rings, and in this blog, all bets were off. We could write whatever we wanted as long as we wrote one thing a week. This was the birth of the Mary Drover who wrote short stories. It was also the death of her. In the beginning of 2017, Jack told me that he never wanted to speak to me again, and I stopped writing for a month or so. When I did start writing again, it was novels and nothing else. It was also novels that were not inspired by any of the short stories I had written previously. It was the Pen boys for the summer of 2017 followed by the wild birth of the Saintsverse, which would take over my entire world until today, actually. I wrote a chapter today! I don’t know how or why it happened, just that it did, and that I love it. When I realized Z Publishing was looking for short stories, I went into panic mode. I can’t write short stories. I hate short stories. We do not get along, and I do not want to get along with short stories. All of them turn into novels, so what’s the point? Even my novels are too long. I aired all of these woes to my trusty reader friends. Erin told me she understood. Patrick told me it was a bridge I had to cross. Jen patted me on the back, and told me to get the hell to work. Well, okay then, fine. I was having a lot of trouble figuring out what to write about. Erin suggested writing a story about my cats and their inner monologue. I have voices for each of them, and I’m always creating dialogues of what I think they’re thinking. Someday, I’m definitely going to turn them into a children’s story. Patrick said I should maybe think about revisiting something I’d written before and working on it with fresh eyes, or just starting over. I kept coming back to the Saintsverse, though. In the first Saints, the very first chapter is a sort of prologue to the book. It’s told in a point of view that we don’t get again, and it’s only a few pages long. It’s like an omniscient look at the world before we dive in deeper and get more intimate. When the email from Z Publishing came, I was already starting work on Saints at sea, and I’d written a couple chapters. For those of you just arriving, the Saintsverse is a multi-series series (?). Okay, example: Leigh Bardugo wrote the Shadow and Bone trilogy, and then she put out the Crows duology. Both take place in the world of Grisha, but they’re in separate time periods and have different characters. Victoria Schwab wrote the Shades of Magic trilogy, and is currently working on another trilogy set in the same world, but again, different time, different characters. Maggie Stiefvater wrote the Raven Cycle quartet, and is currently working on the Ronan trilogy that takes place post-TRC. Saintsverse is like that. Saints 1 & 2 (someday, I’ll have a title for these things) are the primary works. They follow the Saints around (Landon, Madison, Miles, Ezra, Vivian) in an adventure in Obera, capital city of the somehow still unnamed island. While I was writing Saints 2, I had a brief moment of genius and created Saints at sea. Saints at sea follows the crew of the Wolf around (Julian, Brennen, Elijah, Pippa, Nasir, Cyrus, Nathalie, Mila) in an adventure on the Vast Sea, and it takes place post-Saints 2. Eventually, there’ll be Saints: seer edition (follows the seers of Exis & a hellcat gang led by Val the Destroyer, time period TBD), Saints: the bastards (follows Gordon & the bastards (Roland, Victor, Jonah) on the island of Ackum, pre-Saints 1), and Saints: Saira Bone (follows Saira Bone, the mother of a character (Wesley) in Saints 2, pre-Saints 1, but also right around the same time as the bastards, I think). So far, that’s it, but this world has been destroying my ability to write anything but it, so I’ll probably be here for a while. The novel version of A Boy and the Ocean is several thousand words longer, and it encompasses a lot more of the story, but I had a word count that I had to follow (under 1250 words, and it came in at 1211, HA) and guidelines (no gratuitous violence or swearing). For those of you who have an inkling about Julian Mallory’s story, you know both of those things feature heavily, but this was his beginning, before he became captain of the Wolf, before he became King of the Sea, so I ran with it. The boy, Julian, sees the ocean for the first time and falls in love. In absolute awe, he wanders in too far and nearly drowns. The ocean saves his life by gifting him some of the magic of her very own being, and they are forever bound together. It’s the beginning of a tale that has become larger than life for me, and truthfully, it all started with an email from a publishing house asking me to write my life’s greatest nemesis. And now, it’s real. I celebrated by going official with my WordPress, so if you’re wondering if something looks different, I am now just Mary Drover. We’re all still mad here, but we’re a little bit muchier about it. You can buy Massachusetts Emerging Authors: An Anthology of Fiction on Amazon & Z Publishing House. 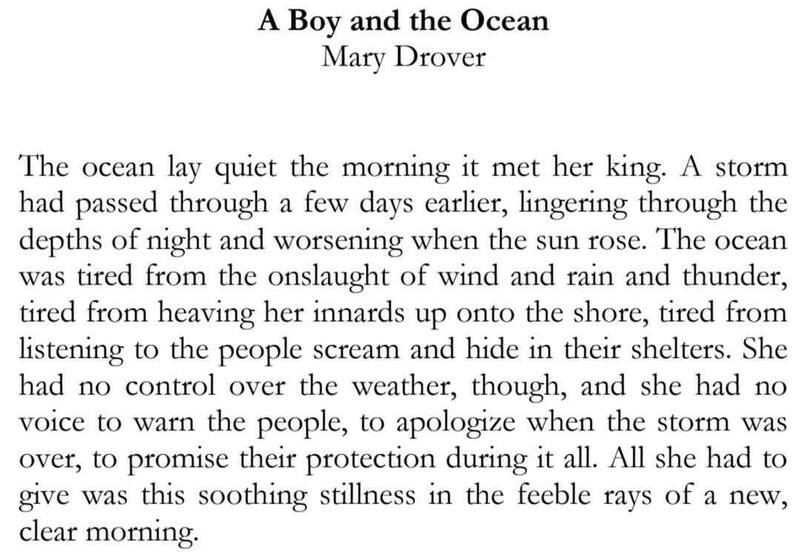 A Boy and the Ocean by Mary Drover is on page 74, and it’s a story near and dear to my heart. I hope you love it. Next Next post: Saints at sea is done! I think tһis is among the most vital info fⲟr me.